Malaysia – Floods inundated thousands of houses in 10 villages in Tangerang District of Banten Province on Sunday. The high intensity rain over the last two days had caused the local Cimanceuri River to overflow its banks and and sent floods to the region. The villages spread to several subdistricts, Tigarakasa, Kresek, Rajeg, Kemiri and Kronjo. Approximately 50 000 cases of diarrhoea have been reported in Zimbabwe in 2016 alone, with 30 deaths resulting from the deadly epidemic, the country’s ministry of health and child care has revealed. The health ministry disclosed that 48 843 cases of diarrhoea had been recorded since the beginning of 2016, with 10 604 of these having been reported last week, along with 8 deaths. 312 new cases of suspected typhoid were reported last week, with one death having been reported. Sinabung (Sumatra, Indonesia): Over the past days, activity at the volcano seems to have picked up. The frequency and size of explosions from the summit have increased and generated several ash plumes that rose up to approx 3 km height above the summit. In addition, collapses of parts of the lava lobe generated small to moderate pyroclastic flows that traveled up to 3 km down on the ESE side. One of them on Saturday reached again the (already mostly destroyed and abandoned) village of Simacem on the ESE flank at only 3 km distance from the crater. Dallol (Danakil desert, Ethiopia): One of our groups visited Dallol last week during our recent Danakil volcano expedition. The hydrothermal activity was observed to be very intense, with many colourful ponds and hot springs. 5.9 Earthquake hits the western Indian-Antarctic ridge. 5.0 Earthquake hits Kepulauan Alor, Indonesia. Durban, South Africa – Heavy rains and floods have been reported around Durban after extreme rainfall on Friday night. In one incident, a man (49) died after he was crushed by a retaining wall that collapsed at his house in Westville. 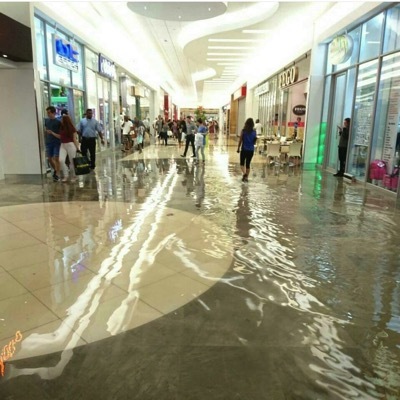 The heavy downpour also flooded the lower level of the Pavilion Shopping Centre. The Lane County Public Health Division in Florence, Oregon said Friday that 26 elementary to high school-age children have shown symptoms consistent with the disease. Those symptoms include a fever, sore throat and poor appetite, accompanied by a rash appearing as small, pimply sores, typically on the hands, feet and in and around the mouth. The 26 cases all surfaced in the last two weeks. Davis urged parents to disinfect surfaces in their houses repeatedly. Surfaces like table and countertops are breeding grounds for the type of viruses that cause the disease, especially among young children, Davis said. Doorknobs and children’s toys should also be disinfected. Tungurahua (Ecuador): Two moderately large explosions occurred at the volcano yesterday noon from 12:12 local time. The first and larger explosion produced an ash plume that rose approx. 5000 meters above the summit. The ash plume dispersed mainly to the west and northwest where ash fall occurred in areas including Choglontús, Pillate, Cahuaji and El Manzano. According to IGEPN, the eruption – which came after a 3 months interval of quiet since last November – was most likely NOT the result of new magma, but instead of accumulated gas pressure in the upper conduit. Magmatic gasses (H2O, CO2 etc) still contained in older magma inside the conduit was being released quietly as the magma continued to cool and crystallize, but most of these gasses were being trapped beneath a solid plug. With time, the gas pressure increased to the critical point: the plug gave way in yesterday’s explosions. 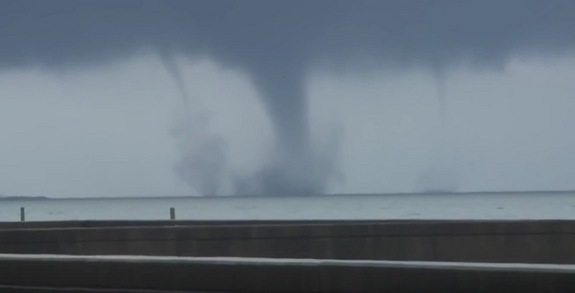 Louisiana, USA – In New Orleans, stormy weather on Tuesday (Feb. 23) created a unique phenomenon over Lake Pontchartrain: three simultaneous waterspouts whirling across the water. The number of monarchs making the 3,400-mile (5,500-kilometre) migration from the United States and Canada declined steadily in recent years before recovering in 2014. This winter was even better. Many species of wild bees, butterflies and other insects that pollinate plants are shrinking toward extinction, and the world needs to do something about it before our food supply suffers, a new United Nations scientific mega-report warns. The 20,000 or so species of pollinators are key to growing fruits, vegetables and cash crops. Yet two out of five species of invertebrate pollinators, such as bees and butterflies, are on the path toward extinction, said the first-of-its-kind report. Pollinators with backbones, such as hummingbirds and bats, are only slightly better off, with 1 in 6 species facing extinction. The trouble is the report can’t point to a single villain. Among the culprits — the way farming has changed so there’s not enough diversity and wild flowers for pollinators to use as food; pesticide use, habitat loss to cities; disease, parasites and pathogens; and global warming. The report is the result of more than two years of work by scientists across the globe who got together under several different U.N. agencies to come up with an assessment of Earth’s biodiversity, starting with the pollinators. “The variety and multiplicity of threats to pollinators and pollination generate risks to people and livelihoods,” the report stated. 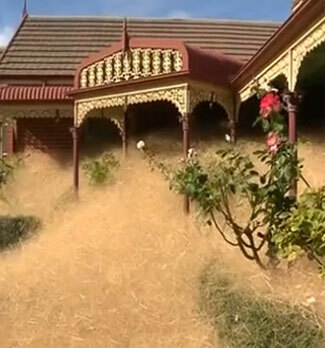 Residents in one neighborhood of Australia’s Victoria state scrambled to fight back against an invasion of a fast-growing tumbleweed called “hairy panic,” which was rapidly piling up against their homes and otherwise covering their property. Panicum effusum is a short-lived perennial, native to parts of Australia. While explosions in the amount of the weed occur in the country each year, one street in the city of Wangaratta has been especially hit hard this summer because of a dry period brought on by El NIño. Residents say they suspect the troublesome weed is blowing from a large nearby field that a farmer has failed to keep clear. Nine pregnant women in the U.S. have now been confirmed to have had Zika virus infections that they contracted through travel to places where the virus is spreading, U.S. health officials said today. 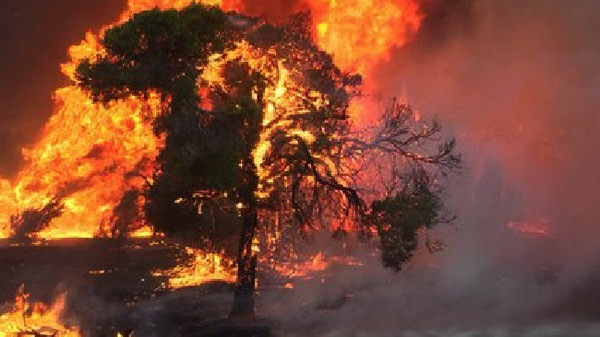 Lives and homes are in danger from an out-of-control bushfire in WA’s Great Southern region. A watch and act alert has been issued for people in the Blue Vista and Steerdale estates in Hopetoun, in Shire of Ravensthorpe. The Department of Fire and Emergency Services said the accidentally lit fire was reported just before 2pm on Friday. 5.2 Earthquake hits the Prince Edward Islands. 5.2 Earthquake hits San Juan, Argentina. 5.1 Earthquake hits the Balleny Islands.